The yard and garden spaces on your property create the perfect backdrop for your home. They lend greenery and a refreshing feel to the space and add value to the property as well. Once the plantings and lawns have been installed, they need regular care and maintenance. Most people opt for landscape maintenance contracts, and fertilization is a very important aspect of these. 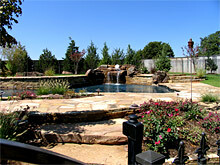 Damon Johnson provides excellent landscape fertilization services to customers in and around Edmond and Oklahoma City. Fertilizers are a very essential aspect because plants need the right kind of nutrition to grow well and endure the climatic changes. Credible landscaping companies always use high-grade organic fertilizers that don’t cause any harm to either the plants or the environment. Every landscape is a mix and match of different types of plants, trees and grasses. Just as these have different watering needs, their fertilization requirements differ as well. This is why it’s important that the company which handles your landscape maintenance provide you custom yard fertilization plans. When your plants get these regular fertilizer applications, they will grow stronger and you will notice a distinct change in the way they look. Your landscape will look greener and more colourful right round the year. Disease-resistance- Healthy plants, trees and grasses are always disease-free; but that can happen only when they have the capacity to resist disease. And that’s exactly what the right kind of garden fertilization does. The formulations that the company uses will be effective, yet gentle on your landscape and this will help it grow better. Lawn fertilization- Lawn spaces tend to see a significant amount of wear and tear. Aside from this, they are also vulnerable to attack from garden pests. The only way you can ensure that the grass is able to withstand all these conditions is to get them fertilized with regularity. This will discourage the growth of weeds and make the grass stronger too. When you have plantings and lawns on your property you need to ensure that they are fertilized well. Hiring landscaping experts like Damon Johnson ensures you get the kind of solutions you need at fertilization cost that will fit perfectly into your budget.